Quincy’s QCS condensate purifier is superior to all gravity type separators, and is far superior to the big, black bottle units that trap dirty condensate in a heavy, rock-like media. 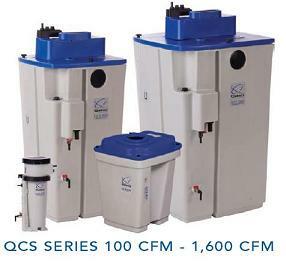 The QCS is much lighter, cleaner, and far easier to service than any other condensate processing device. The QCS removes all compressor fluids including polyglycols. Several sizes are available to allow for single or multiple-unit configurations. QCS capacity can be extended for increased demand by installing additional units and operating them in parallel with the originals. * Please see “Condensate Management” brochure for sizing instructions.